A 4th place in the 4th round at Brands Hatch was a sign that he was getting on the pace. It didn’t follow on the 5th round at Oulton Park in Cheshire last Monday., the Van Diemen just wasn’t up to the speed of the faster Rays and Mygaels. It wasn’t the most competitive of classes further down the field but he had some memorable races at the head of affairs with Michael Keohane. His championship success also gave Shanahan the distinction of being chosen as the 1997 Dunlop Driver of the Year. In 1998 Neil earned yet again the Dunlop Driver of the Year accolade. Neil Shanahan is no longer with us and the world is a sadder place. Neil Shanahan R.I.P. The Norfolk motor racing community was in mourning last night after Hunstanton driver Neil Shanahan died following a 100mph three car collision at Oulton Park. 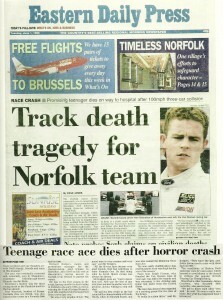 The Irish-born teenager, widely regarded as one of the most promising racers in the business, died on his way to the hospital after being airlifted from the Cheshire track where he was competing for the Attleborough-based Van Diemen team in the Formula Ford Zetec championship. An investigation was launched into the accident which took place on the second lap of the 12-lap race in front of a 25,000 crowd which included the 19-year-old’s mother and father who had flown over from Dublin for the event. It is understood his car went off the track at Clay Hill where the drivers would have been building up to their 120mph top speed. The race was eventually restarted and ironically won by Shanahan’s teammate. Attleborough-based Ricardo van der Ende. Yesterday’s fatality was the third racing death at the Cheshire track in the last decade. Paul Warwick, brother of former Formula One ace Derek, was also killed at the venue in a Formula 3000 race in 1990. Richard Rodgers, media and promotions manager for the championship, paid tribute to Shanahan, who lived on his own at Hunstanton, having moved to Norfolk from Ireland to pursue his career. He was in the first season in the event having excelled in kart racing in Ireland in the early 1990s, as well as winning the Ford of Ireland Formula Ford title and the Irish Formula Ford Zetec crown last year. Team boss Ralph Firman, who founded the Van Diemen team 25 years ago, was told of the tragedy and was returned to his Attleborough home last night from the United States. The team has always been regarded as a training ground for the stars of the future. The conditions at Oulton Park yesterday were dry and sunny which boosted a crowd drawn to the circuit to witness the popular British Touring Car Championship. Shanahan’s other teammate, James Courtney, who finished fifth yesterday, also paid tribute. The death of a rising Irish motorsport star Neil Shanahan was caused by a freak “trillion-to-one” accident, according to his Van Diemen team boss Ralph Firman. 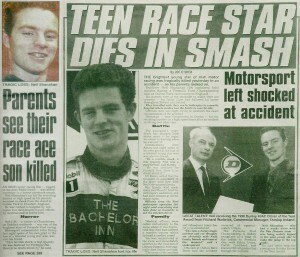 The tragic teenager was killed during a Formula Ford Championship race at Oulton Park in Cheshire, England last Monday. He was chasing his dream of becoming Ireland’s next Eddie Irvine and had been thrilled to secure a drive in Formula Ford with the Van Diemen team. Irvine raced with the same squad in 1987 and won the British Championship. Although the official investigation into the accident is still continuing, Firman is certain Shanahan was killed when a broken front wheel entered the cockpit. The Van Diemen boss said: “It is a trillion-to-one situation. If it had hit the cockpit 2mm one-way or the other, the wheel would have bounced away.” Firman also led the praise for Shanahan’s unique driving skills. “He was a young driver with a great deal of potential talent,” he said. 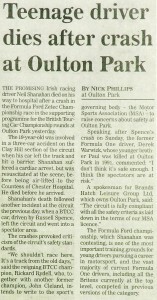 The promising Irish racing driver Neil Shanahan died on his way to hospital after a crash in the Formula Ford Zetec Championship race in the supporting programme for the British Touring Car Championship rounds at Oulton Park yesterday. The 19-year-old was involved in a three-car accident on the Clay Hill section of the circuit when his car left the track and hit a barrier. Shanahan suffered a cardiac arrest, but was resuscitated at the scene, before being air-lifted to the Countess of Chester Hospital. He died before he arrived. Shanahan’s death followed another incident at the circuit the previous day, when a BTCC car, driven by Russell Spence, left the circuit and went into a spectator area. The crash provoked criticism of the circuit’s safety standards. “We shouldn’t race here. It’s a track from the old days,” said the reigning BTCC champion, Rickard Rydell, who, together with another former champion, John Cleland, intends to write to the sport’s governing body – the Motor Sports Association (MSA) – to raise concerns about the safety at Oulton Park. The Formula Ford championship, which Shanahan was contesting, is one of the most important training grounds for young drivers pursuing a career in motorsport, and the vast majority of current Formula One drivers, including all the Britons currently at the top level, competed in previous versions of this category. Neil Shanahan, one of the brightest prospects in Irish motor sport, was tragically killed in Oulton Park, Cheshire in England yesterday, whilst competing in the fifth round of the Slick 50 Formula Ford Zetec Championship. The 19-year-old was involved in a three-car collision on the second lap at Clay Hill corner and died as he was being airlifted to hospital. Neil Shanahan began his motor sport exploits in Junior Karting in 1993, three years later, he finished runner-up to Michael Keohane in the Formula Karting Championship. He was also second overall in the Southern Karting Club Championship and third overall in the Irish Karting Club Championship. The same year, 1996, he was awarded the Philips Trophy by the Royal Irish Automobile Club for the most improved Driver of the Year. Neil made an immediate impact in his move into single seater racing the following year and won the DHL Star of Tomorrow Formula Ford 1600cc Championship. The Churchtown teenager won a total of ten races en route to success. He was also a winner at the Phoenix Park Races in the same category and was the dominant force in the Ford Zetec Championship in 1997.